More than five years of testing, upgrading and improving to create the most technologically advanced growing system on the planet. From growing greens like lettuce and fruits, the system was move indoors to maximize the production of more lucrative plants. 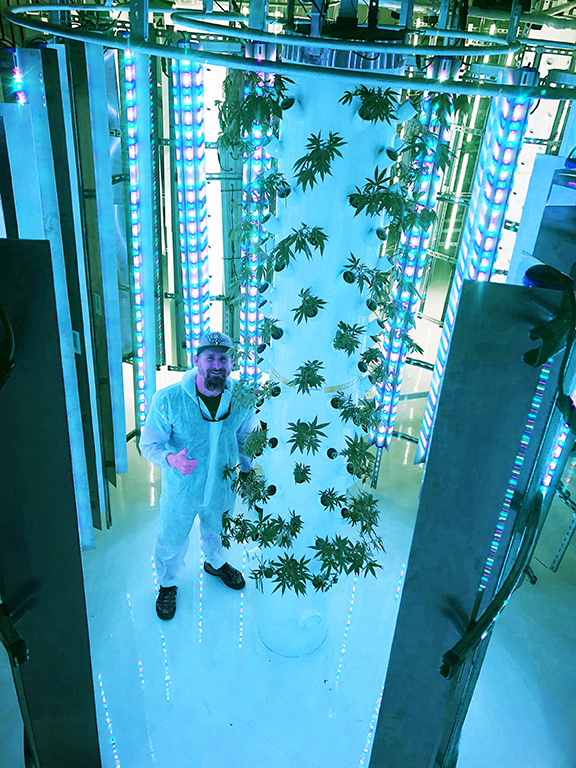 Go Vertical and Automate Your Grow! Growing Cannabis with Sea Of Green (SOG), single large cola technique. The time required for the three-step process of clone, veg and flower has been reduced by weeks, reduces plant stress, and floor space needs. Why do things the old-fashioned way, moving plants from pot to pot, risking plant stress, taking up valuable growing space, not to mention the dirty mess working with soil and husk can produce? With our CropTowers, all these inconveniences are gone! We have reduced the veg process to days, not weeks, meaning you increase the number of harvests/year (turns) per tower. That increases your capacity by up to 3 times your current yield and more than doubles your revenue! And as an added bonus, In our CropTowers, the roots are harvestable and processable into valuable and unique CBC oils. SHOULD BE YOUR GROW PARNER. Triple your production capacity and revenues by going vertical in your existing space. We don't have a magic growing potent, we just use space better than anyone. No need to relocate to expand! We can grow 102 plants in an 81 SF area, surrounded 360 degrees with finely-tuned LED lights, maximizing light on plants. You'll reduce your labor costs, water costs, supplies costs; reduce clone and veg time and have a perpetual 60-day harvest cycle no matter the weather. The CropTower© grow area will be conditioned and maintained as an environmentally balanced space (A/C, RO, rH, CO2) by us. Get a turnkey, professionally installed system designed to fit your exact floor space. We train your staff and maintain the equipment. Perpetual harvest means you're always harvesting, so while you'll need fewer staff, you can hire full-time, higher quality, people, not part-timers.